Deliciously spooky, this adds a modern touch to the stories that the Greeks told about the Underworld. Riveting! 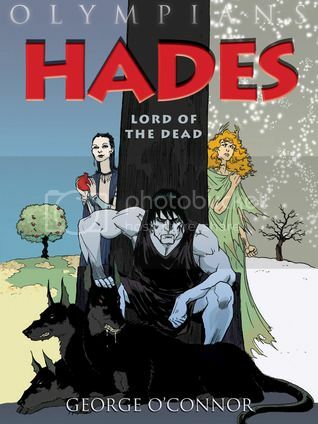 After an informative introduction to the territories of the underworld including the River Styx, Erebus (kind of like Hell's waiting room), and Tartaros (where the evil are punished) the story jumps right to the Persephone myth, also known as Kore. I loved her transformation into a Goth princess when she begins to warm up to the idea of ruling the underworld. When angry Demeter has finally sussed out who is ultimately responsible for the disappearance of her daughter, the looks on the faces of Zeus' entourage are priceless, "Oh Zeus... what did you do now?" a mildly annoyed Hera says. Flirty Hermes is also a hoot, when he questions Hekate, Demeter's sidekick, who intones her story to him, he replies, "I like you, you're nutty." One vital change from the original story was the use of Persephone's pomegranate seeds. While there are always several versions to most of the Greek myths - usually that Persephone is tricked into eating the seeds trapping her in the Underworld for part of the year, or famished, she finally gives in and eats just a bit before she is rescued, in this version, Persophone does NOT actually eat any of the seeds - but she tells her mother that she did so that she can return to the god Hades, whom she has grown to care for. The book is appended with an author's note, footnotes on several historical details included in the artwork, a call sheet for several of the gods featured in the story and a bibliography featuring recent and/or notable sources for additional information on mythology. This is a great series. Percy Jackson fans will eagerly devour these appealing graphic novels inspired by the Greek gods. This looks like a lot of fun! I'll have to make sure that our bookstore carries this when it's published. I like the whole series. Athena, Hera and Zeus are already out.